There is a need to unpair Apple watch without iPhone in case if you have lost your iPhone. Suppose you have purchased new iPhone, then you have to pair it with the new one thereby removing its paring features from your old iPhone even in its absence. When the paired iPhone has been sold, then you should unpair the Apple watch immediately. It can be done without the presence of the iPhone. 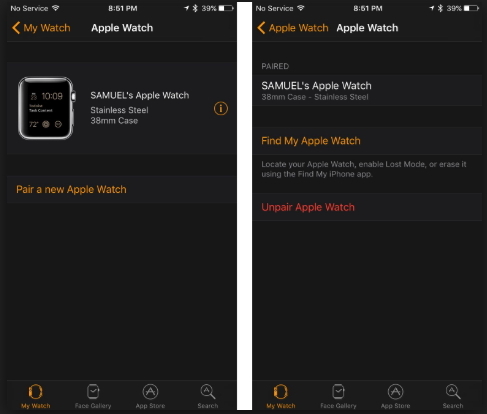 This article provides you with effective guidelines to unpair the Apple watch from its respective iPhone even when the iPhone is not nearby. Let us make use of the settings option in your Apple watch in order to unpair your iPhone in its absence. The steps are very simple and you can complete the procedure in no time. Make a note of the given steps for successful completion of the process. Step 1: Unlock your Apple watch and go to the ‘Settings’ option. Step 2: Click on ‘General’ from the expanded list of Settings. Step 3: Select ‘Reset and Erase all contents and settings’. By choosing the reset and erase all contents and settings on your Apple watch, you will be able to restore the system to its factory settings thereby removing its old settings. You can now make use of iCloud platform to remove the Apple watch paring settings from your iPhone in an online mode. Here you are going to use computer. Open you computer and go to the iCloud official website. Now sign in using your Apple ID credentials. Tap on ‘Find My iPhone’ and surf through the listed devices. Click on ‘Select all devices’ and choose your Apple watch from the displayed list. Select ‘Erase Apple watch’ and proceed with the ‘Next’ button. You have to click the ‘Next’ button until the Apple watch is completely removed from your iPhone. Finally tap the ‘X’ symbol near your Apple watch to unpair it from your iPhone. You have easily erased Apple watch from iPhone in an online mode. To carry out this process it is enough if you sign in to your iCloud platform. Even in the absence of your iPhone you can now remove the pairing features of your Apple watch. This process will be really helpful during emergency situations at the time of loss. In case if the Apple watch and iPhone is in the close proximity then you can make use of the below given guidelines to carry out the un-pairing process. Step 1: Place your iPhone and Apple watch nearby. Step 2: Unlock your iPhone and launch your Apple watch. Step 3: You can identify your Apple watch at the bottom of the screen and click on the icon. Step 4: Select the ‘Unpair Apple watch’ option in order to alter the pairing settings between the iPhone and Apple watch. Step 5: Confirm t the prompt regarding the un-pairing process again. Step 6: The Apple watch gets detached from your iPhone in no time. After this process iPhone will try to make a copy of the content available in the Apple watch for future reference. The un-pairing process leads to the deletion of the existing content present in the Apple watch. It is better to setup a backup to avoid unnecessary issues in future. During unexpected happenings like iPhone theft, you have to carry out certain measures to retrieve the data available in your device in an effective manner. You can opt for online platform to achieve this task. iMyFone D-Back iPhone data recovery assists you in recovering data in an optimum way. This data recovery software adopts 4 modes to complete this process. You can make use of this software to recover data from lost iPhone and fix various types of iOS issues within the short period. It supports more than 20 types of data. Let us learn to create a backup through iCloud platform using iMyFone data recovery software. Step 1: Download the software. Install it and launch the application to initiate the recovery process. Step 2: Click ‘Recover from iCloud Backup’ tab in the left panel of the screen. Step 3: Select ‘Start’ button which is displayed at the right panel. Step 4: Choose the files you want to recover and proceed with the ‘Next’ button. Step 5: Fill in the iCloud account details and log in to the iCloud platform. Step 6: The data available in the iCloud account will be listed. Step 7: Go ahead with the ‘Next’ button and make a preview before triggering the scanning process. Step 8: After the completion of scan click ‘Recover’ button at the bottom right side in the screen. 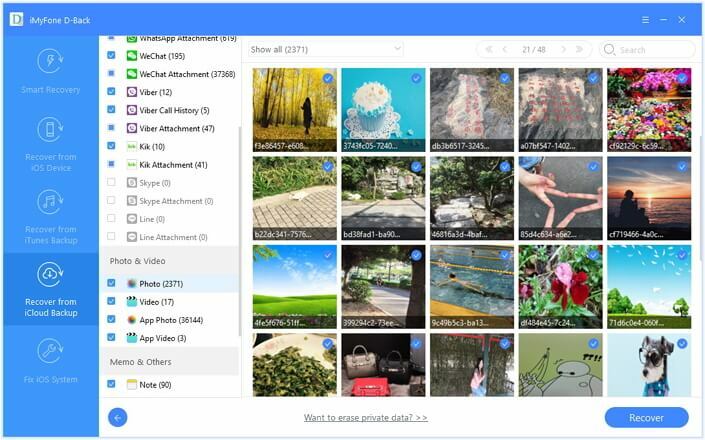 Step 9: The data will be recovered and navigate through the folders and find optimum location in your computer to store the recovered data. Therefore iMyFone D-Back is the best tool to restore the data using iCloud, iTunes platform. You will be able to achieve this process without any data loss. It is an effective method and you can rely on this without any regrets. Hurry up and download right now to enjoy the benefits of iMyFone data recovery tool.